Nunda ezhibiigaadegin d’goh biigaadehknown ezhi debaahdedek nungwa manda neebing Mnidoo Mnising Neebing gah Bizh’ezhiwaybuck zhaazhi gonda behbaandih kenjih’gehjik. This essay is part of an ongoing series reflecting on this summer’s Manitoulin Island Summer Historical Institute (MISHI). I came to Manitoulin Island as a part of MISHI not knowing what to expect. As a person of Mi’kmaw ancestry living away from my territory, I often feel a strong sense of dislocation in my day-to-day life. University and academic settings are no different. MISHI, however, was a different kind of academic setting, drastically different than every other institutional educational experience I have experienced. 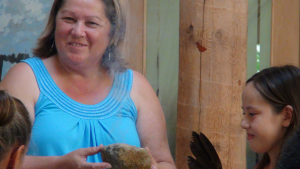 My days on Manitoulin Island were spent getting to know different parts of the land, gratefully listening to Anishaabeg stories and teachings, experiencing their art, and hearing their histories. 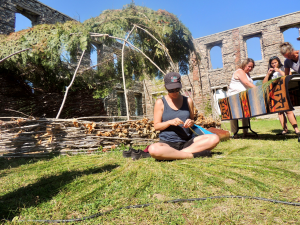 Violet King untangling sweet grass in the ruins of the priest’s house in WIkwemikong. I came to Manitoulin Island and joined MISHI at the very end of my degree from York University. Learning some of my own history and the histories of other nations in an institutional setting was difficult at times. However, I am grateful to have studied under a few incredible professors who were generous with their time and offered me inspiring examples of academic vigor and personal integrity. So much of academic learning is a solo mission, and much of my learning has taken place between stacks of books and searching online archives and journals. At MISHI, learning was not a solo performance in books, rather, learning was experiential and collective. My first impression was an enduring one. I was affected and inspired by the community-building that was taking place among both the Indigenous community and my group of fellow students. 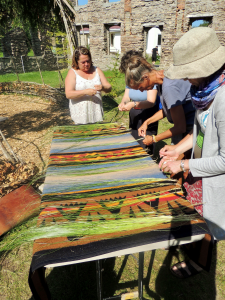 It resonated deeply with my desire to take part in my own community’s growth and healing. Peggy Pitawanakwat, former chief of Wikwemikong, gives sweet grass to MISHI participants. My undergraduate studies explored the differences between settler reproductive rights movements and feminist or reproductive rights of Indigenous women. Much of this work has involved reading and studying a very dark part of Canada’s history. Coercive sterilization, the 60’s scoop, and the Indian Act remain ongoing issues that Indigenous communities struggle against. My research has focused on the ways that my family’s lives continue to be affected by laws and regulations that limit how we live. During MISHI, I connected with, and experienced first-hand, the positive outcomes of a community’s dedication to uplift itself. When I would reflect on my own life and home community, I saw how much work is needed to heal from colonialism. 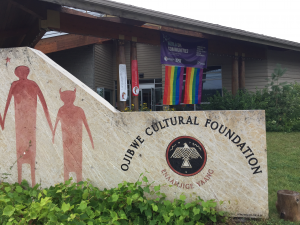 The Ojibwe Cultural Foundations (OCF) community organizers breathed some hope in to my learning and research. The OCF is a cultural hub. It is a radio station, art gallery, museum, archive, childcare centre, community kitchen, and much more. The OCF, and all the people who make the OCF what it is, inspired me to alter the focus if my work to include ways to build community strength. Front of Ojibwa Cultural Foundation in M’Chigeeng. Through conversations with my peers and community members I witnessed a need to focus on all of the ways that we as Indigenous peoples have been succeeding and resisting. An abundance of non-Indigenous people are focusing on Indigenous hurt and suffering. What makes us strong is more than simply surviving. Our survival of ongoing colonization reminds me that we are strong. It is one component among many that make us who we are. I appreciate the work of allies, but I need to step up as an Indigenous woman to contribute to healing my community. I find strength in the continual love and community perseverance, which has shaped me. Stories of survival are important and have their place. They are key to understanding the history of colonization and the oppression of Indigenous women’s bodies. Yet, they are also key to finding a way forward. After spending time on Manitoulin Island, I felt I was allowed to break away from institutional ways of knowing, learned in books, focused on the past, and experienced alone, and I was encouraged by my surrounding to focus on Indigenous futures and find ways to move forward collectively, learning from people and places and by doing. Working with former Wikwemikong Chief Peggy Pitawanakwat (a fellow MISHI participant) was a rare opportunity and she highlighted this way forward for me. Her vision of how to develop our shared project on women leaders made transparent her role as a community leader and educator. Peggy Pitawanakwat with her granddaughter Natalia, giving opening prayer for MISHI. Together a group of us developed ideas for creating a booklet documenting former female chiefs. Promoting the celebration and remembrance of the history of strong Ojibwe women was refreshing and encouraged my desire to amplify Indigenous women’s accomplishments. My time at MISHI reminded me of all of my reasons for applying to university and sticking with it through all of the difficulties I experienced. MISHI reminded me that there are multiple versions of Indigenous futures and multiple ways of developing our futures. Mine will be to encourage women to collectively develop their own power and voice to resist colonial regulation and to embrace the beauty of our shared past of leadership and strength. Violet King is of Mi’kmaq heritage from Newfoundland. She just completed her BA Honours at York University with a joint degree in Indigenous Studies and Gender, Sexuality, and Women’s Studies.She is headed off to graduate school where she plans to study the forced sterilization of Indigenous women in Canada. Manitoulin Island Summer Historical Institute (MISHI) 2017: Does Wisdom Sit in Places? Sites as Sources of Knowledge” was a five-day summer institute held from August 14-18, 2017, focused on understanding how place-based knowledge shapes an Anishinaabe-centred history of Manitoulin Island and its environs. Co-sponsored by the History of Indigenous Peoples (HIP) Network, a research cluster embedded within the Robarts Centre for Canadian Studies at York University, and the Ojibwe Cultural Foundation (OCF), an organization devoted to Anishinaabe history and culture, the summer institute brought together twenty-five established and emerging historians, graduate students, administrators, artists, Elders, and knowledge-keepers to explore the history through landscapes, stories, and documents. These blogs are their stories about what they learned. I’d love to see the booklet on female chiefs. Good work!